Eternal, undeclared, illegal, aggressive war. In Libya, Syria, Iraq, Mali, Afghanistan, Pakistan, Sudan, Chad, Somalia, Nigeria, Philippines, Honduras, and Yemen. Universal surveillance. General Warrants. Secret courts. National Security Letters. Endless imprisonment without trial or charge. Effective abolition of the writ of habeas corpus, notwithstanding that it is in the US Constitution Article I, Section 9. Black sites. Rendition. Special Ops death squads. Assassination of US citizens without trial or charge. Including juveniles. Robot bombs sent to assassinate more than 2,000 civilians so far in neutral countries with which we are not at war. Mercantilist trade policies such as TTIP, TPP, NAFTA. Okay, Hillary was for TPP and helped write it, until she was suddenly against it a few months ago. Fracking. Bailing out Wall Sreet, AIG to the tune of $318 thousand million dollars, then also bailing out big banks like Citi, who were already re-insured by AIG. But Obama could not find $20 billion to bail out Detroit’s pension funds, nor $60 million for public works to replace all the lead pipes in Flint. The counterforce, counterintelligence military strategy of the Western Powers in the Middle East is a complete failure. Maybe we should stop bombing people in their own countries for no reason other than profit. What if ISIS was dropping flying robot bombs and killing people near your home every week. Would that make you want to surrender to them and let them install a new puppet government? That is the model the western powers are following. It only serves the interests of the super rich industrialists who profit from eternal war, and the giant bloated militarys designed to fight the Soviet Union which had ten thousand nuclear weapons, 50 thousand tanks, and six million men under arms. The media has managed, through selective reporting and selective outrage like that over the atrocities on Belgium this week, to get people so scared that they treat IS, which is 2-3 divisions worth of light infantry and press-ganged, barely trained conscripts, as though it is an existential threat on the scale of the old Soviet Union. Yesterday I got on the 73 bus from Harvard Station. This bus goes toward Watertown where two of the “terrorist suspects” were picked up yesterday. Almost immediately the driver breathlessly got on the radio and reported a “suspicious person”. “He is watching all the buses and writing down something on a clipboard”. I thought this interesting so I got off at the next stop (which the driver missed till I reminded him) and walked back. I sat down next to the “suspicious person” and observed him. Sure enough he had a printed form on a clipboard and was watching every bus and looking at everyone on board writing something down about it. He was mid 50ish, short greyish hair, light complexion, blue slacks and a green windbreaker. He sighed and said “Yes that happens a lot to me. I don’t mind the hassle personally, I can deal with it, but what bothers me is seeing my America turned into a police state. They keep announcing ‘if you see something, say something’, its like ‘1984’”. Previous Scanlyze stories on ‘terrorism’. The New York Times, Wall Street Journal and CNN are reporting that today, April 27, 2009, an “Air Force I lookalike” and two F-16 jet fighters frightened New Yorkers with low-level maneuvers over Manhattan and New Jersey. 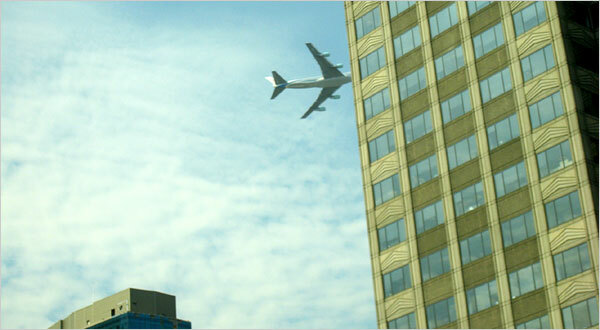 Many office buildings were evacuated and people who had lived through 9/11 were re-traumatized. The New York Times reported that during the exercise, the Dow-Jones dropped 40 points in ten minutes. The U.S. Air Force confirmed that an “aerial photo mission,” which involved an F-16 fighter jet, had been carried out Monday in the area of New York City by the Presidential Airlift Group, which according to the White House Web site is responsible for maintaining and operating presidential airliner Air Force One. “This mission was conducted in conjunction with normally scheduled continuation training for assigned aircrew members,” the Air Force said in a statement. The mission was scheduled to last from 10 a.m. to 10:30 a.m. EDT. A spokesman for the Federal Aviation Administration said the maneuver wasn’t an emergency and was coordinated in advance with state and local officials. The Port Authority of New York and New Jersey, which operates bridges, tunnels and airports in the area, said initially the agency had no knowledge of the low-flying plane, according to a spokesman. But several Port Authority executives, who spoke on condition of anonymity due to an ongoing investigation, said that the agency received a memo from the FAA, but not until sometime Monday morning. The memo specifically directed local agencies not to tell the public about the photo shoot, according to a government official. The memo detailed the nature of the event and the flight details, saying there would be a transport and fighter aircraft flying over New York Harbor. 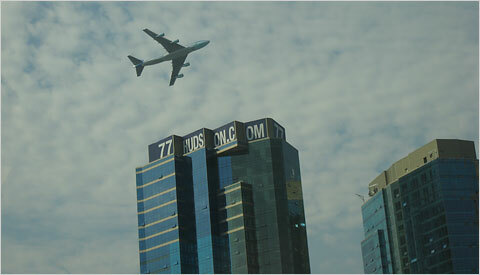 The White House had planned a second photo shoot of a jumbo jet used as Air Force One in Washington D.C next month. The follow-up session would have taken place May 5 or May 6, using the nation’s capital as a backdrop, according to two government officials. One official, speaking on condition of anonymity, said the Washington photo session is being reconsidered, given the reaction to Monday’s flight in New York. I am really curious about the “photo-op” aspect of this mission. Has nobody heard of Photoshop? Was this still photography, or part of some video project? Who and where were the photographers? What was so important about this mission that there could be no prior public announcement, and why must the planes operate at such low altitudes over a populated area? 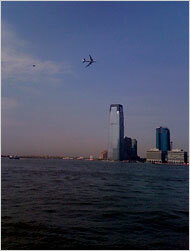 Readers: Did You See the Low-Flying Jet Over Lower Manhattan? Witnesses reported seeing the plane circle over the Upper New York Bay near the Statue of Liberty before flying up the Hudson River. The YouTube video shows dozens of people standing in a parking lot, watching the plane approach. As it nears, they begin to run. Someone unleashes an expletive. “Run, run!” says one person. “Oh my God,” cries another.